Here’s a new detail to add into the cast of your deep sea nightmares: sharks with cameras. In a first-of-its-kind project, scientists at the University of Hawaii and the University of Tokyo affixed flashlight-sized cameras onto the fins of deep-sea sharks. The equipment functioned at depths up to 6500 feet, and every 30 seconds a strobe would flash to illuminate the dark waters before the camera took a photo. Sensors made note of the temperature of the water and the depth, and an accelerometer and a magnetometer took readings as well. At a set date and time the metal band on the camera broke off and floated to the surface, pinging its location to a satellite so researchers knew where to pick it up. The findings were published in the journal PLOS ONE. 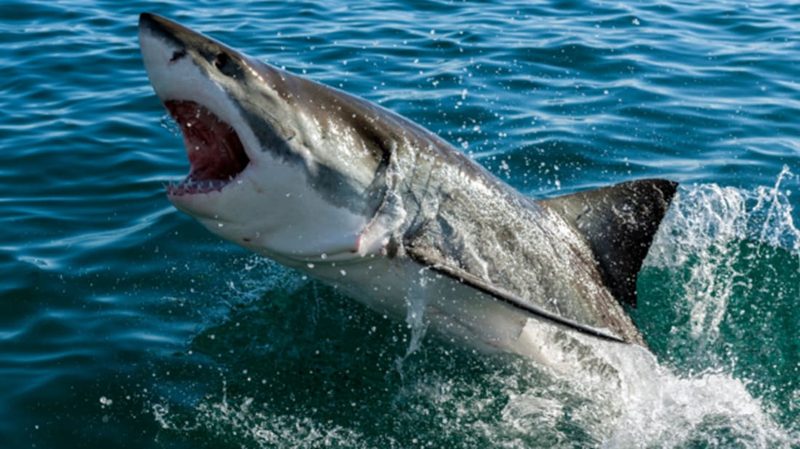 It was previously believed that sharks were negatively or neutrally buoyant, but the data from the study suggest that the six-gill and prickly species of sharks do in fact have a small amount of positive buoyancy sending them up toward the surface. (So fear not—the great white shown above still has to work really hard to do that). That contradicts long-held conventional wisdom that sharks will sink if they stop swimming. The findings were so surprising in fact that Meyer initially wondered whether the equipment was contributing to the shark’s buoyancy, but re-calibrations and repeat experiments affirmed the data. The researchers were able to identify positive buoyancy because six-gill and prickly sharks have to work harder to swim down than up, and are able to glide toward the surface of the water for minutes at a time without using their tails. More research needs to be done to figure out why the trait might exist in these sharks and if others have it as well, but Meyer speculated that it might help them sneak up and catch prey from below. After all, fish gotta swim … and eat. For photos from the project, click over to Live Science.